SINGAPORE (Jan 18): Emerging Asian currencies rose broadly on Wednesday, after the dollar was pressured by U.S. President-elect Donald Trump's comments showing concern over the greenback's strength. The Thai baht climbed to around 35.22 per U.S. dollar at one point, its highest level in more than two months. Te Taiwan dollar touched a three-month high at 31.410. The onshore yuan hit a high of 6.8483 per dollar at one point, its strongest level since mid-November, but later turned lower. 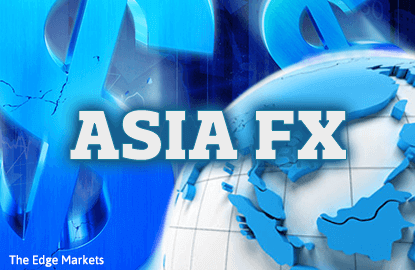 Asian currencies gained a boost as the dollar languished near its lowest levels since early December,against a basket of six major currencies. The dollar index last stood at 100.49, after sliding to 100.26 on Tuesday, its lowest since Dec 8. A selloff in the dollar had deepened on Tuesday after U.S. traders returned from a long weekend and reacted to Trump's weekend comments. In an interview with the Wall Street Journal, Trump said U.S. companies "can't compete with (China) now,because our currency is strong and it's killing us." That gave an added lift to Asian currencies, which have risen this month,on the back of a fierce short-squeeze in the yuan, and as the dollar fell after a news conference by Trump last week offered little clarity on his plans for fiscal stimulus. There will probably be some more profit-taking in long dollar positions going into Trump's inauguration on Jan 20, especially given the uncertainty over what Trump will actually do and how soon, said Jesper Bargmann, head of trading for Nordea Bank in Singapore. "It's going to be very important that he does something around fiscal stimulus, tax cuts and investment pretty quick. Otherwise I think the market will get nervous and sell dollars again," Bargmann said. A Reuters poll last week showed that market positioning was seen as being long the U.S. dollar against most emerging Asian currencies. Trump's comments on the dollar's strength were probably aimed at managing the pace of the U.S. currency's rise, said Heng Koon How, senior FX investment strategist at Credit Suisse. While the dollar may stay weak for now, its strength will robably return after a month or two, Heng said. The U.S. Federal Reserve is likely to gradually raise interest rates, and if Trump succeeds in implementing fiscal stimulus, that will trigger the next phase of U.S. growth and inflation, he said. "Our view is that the dollar will continue to strengthen this year," Heng added. San Francisco Federal Reserve Bank President John Williams on Tuesday said he sees a "good case" for three rate hikes this year,even without any fiscal stimulus, but if the economy accelerates, the Fed would need to raise rates faster.